Nicki Johnson measures a print to be custom framed. Located in a small shop off Chestnut Street in Virginia, Fine Edge Custom Framing is where memories go to be made into keepsakes. Fine Edge, which is adjacent to the Virginia Fire Hall, has been open for business for five years. With more than 50 years of combined experience, Gayle Streier and Nicki Johnson each bring a different niche to the framing business. Streier had always been interested in art, starting in sixth grade at school in Hibbing. She was selected to participate in an after school art program. From there, she studied art all throughout high school in multiple disciplines and went on to pursue a major in painting with an emphasis in art history at St. Cloud State University. After college, Streier enjoyed framing different items for exhibits and worked at a few different art-related jobs. When her husband was offered a job in the mining industry in 2002, they relocated from North Dakota back to the Iron Range. In 2008, Fine Edge Custom Framing was born in Eveleth. Streier became business acquaintances with Johnson soon after, and then they formed a partnership. Johnson’s interest in framing piqued when her late father, Pat Horan, opened up a framing business inside Ben Franklin in Virginia. Johnson would sit in the back and watch her father frame. “I was always interested in art, and both of my parents were interested in art,” said Johnson. When Johnson’s father passed away in 2003, she took a framing course 10 years to the day after her father had taken his course. In 2010, Johnson’s mother retired and sold Ben Franklin and that’s when Fine Edge Custom Framing moved to Virginia. In the autumn of 2010, Streier and Johnson purchased the storefront formerly known as “Button and Bows” and began renovation. With a loan from the Virginia Economic Development Authority (VEDA) and help from their friends and family, Streier and Johnson completed a moderate interior demolition and spruced up the exterior signage. “When we decided to join forces, I wanted to move the business to Virginia because it’s the hub for people from Cook, Ely, Hibbing.” said Johnson. Since Fine Edge opened five years ago, they have completed a lot of framing projects. Everything from kids’ art to photographs to posters are framed, but they don’t stop at just two-dimensional art. They also create object and three-dimensional framing. Some 3D framing objects have included: jerseys, old fishing lures, heirloom pieces, moccasins, baby dresses, bonnets, revolvers, and instruments. “Almost anything can be framed!” exclaimed Johnson. Fine Edge also can design and create shadow boxes, and they also update older frames. “Some frames may need to be reset, or the glass needs to be updated, or even just a few repairs need to be made,” said Johnson. Streier and Johnson take pride in using best practices and preservation techniques. Many of their projects are valued family treasures, so they handle the pieces with TLC. In addition to household custom framing, Streier and Johnson also have assisted those who want art in their clinics and offices. Streier noted that they did custom framing for the Laurentian Clinic in Mountain Iron and for the St. Louis County Courthouse in Hibbing. In fact, they are one of the only local, independently owned and operated custom frame shops left in the Arrowhead region. 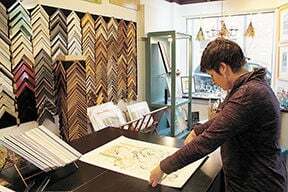 In addition to their framing services, Streier and Johnson also sell local and regional photographs, paintings and cards, all of which can be purchased and custom framed. They also sell other whimsical and sometimes sarcastic items from places like Bruno Press in St. Joseph, MN, and Curly Girl Design in Newton, MA. In addition to frameable items, they also sell jewelry, ceramics, tote bags, paperweights, buttons, magnets, and more.